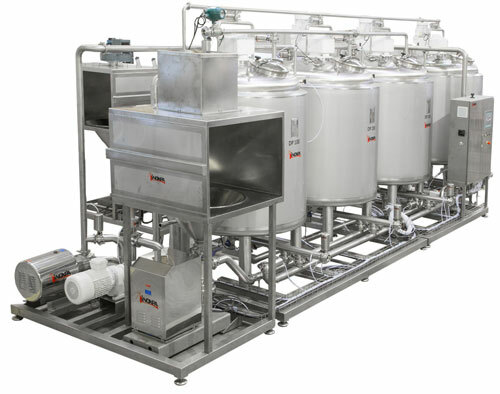 Four 2000 L double-wall tanks, an anchor-type agitator with scrapers; an M440 blender equipped with powder recovery chamber with a mixer and rotary lobe pumps; temperature and level sensors. Production of creams with different flavours (chocolate, caramel, strawberry, etc.). The tanks are filled with water and heated. Then the powder of the required product is added. The product is recirculated, when it reaches a certain viscosity. 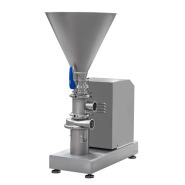 The rotary lobe pump and the mixer help to achieve a better homogenization and texture of the product. The final product must reach the required temperature; a continuous slow agitation with the anchors is applied for this purpose. 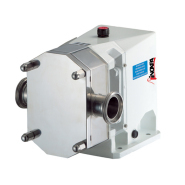 The product is cooled in one of the tanks and a rotary lobe pump transfers it to the filling machine. The skid allows for simultaneous work in any tank. Powder recovery system prevents air contamination. 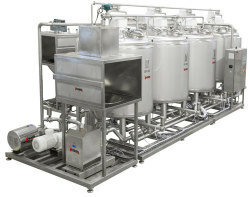 The unit is prepared for automatic CIP. The skid is provided with a PLC and HMI for the recipe edition and production process control and monitoring. The water dosage is carried out with an electromagnetic flowmeter.